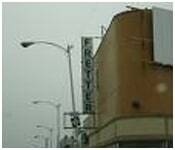 Fretter was an electronics and major appliance retailer based out of Detroit, Michigan, with locations nationally, founded during the 1950’s, by Oliver Fretter. In 1992, Fretter acquired their biggest competition of the time Silo Electronics, a company that had previously not turned a profit since the 1980’s. This was an attempt by Fretter to compete with its new major competition, electronic superstores Circuit City and Best Buy, which were much larger stores than Fretter. This move would lead the company into serious debt and Chapter 11 bankruptcy and forcing the chain to close many locations by 1993. All Silo Electronics stores were closed by 1995, with the following of all Fretter locations closing by May 1996.